Smarty Jr for 6.7L Now works on 2007.5-2012! The 2010 6.7L Dodge Ram Pick up engine is very similar to the 2007'5 to 2009's. Only a few minor things have been changed, looking at them you'd barely notice the difference. Yet, starting with the MY 2010 the electronics , most importantly for us , the ECM are brand new. The ECM's software and operating system has been re-designed from scratch. This has caused us a very time consuming development and beta testing process. It takes a lot of road testing time to validate the research results. As always, here at MADS we strive to make sure that our product is fully tested before it's release to the public. After several month's of road testing under as many different conditions as possible we feel confident that we can now release this first software for the new ECM platform to the public. 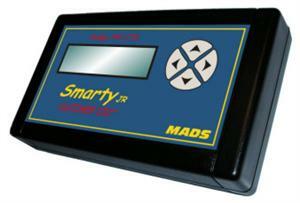 This is an upgrade software for the Smarty JR67. Meaning, any existing Smarty JR67 can be upgraded with it. It is possible to switch back and forth between the 2007.5 2009 software and the 2010 one. Unfortunately, because of the always increasing size of the new software's we're not able to fit them all at the same time into Smarty. That may change in the future.... Research and development is still under progress! 0 = Stock power level. The torque management levels. The R&D is at advanced level but not ready yet for the release to the public. The software for the 2011's. During the R&D stages last thing one wants is to complicate more than really needed. Thus we worked with just the 2010's software. We will implement the 2011 software's into Jr's firmware in the next weeks. Soon to come!